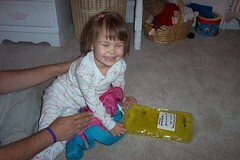 Here is a picture of Abby with her Methotrexate infusion bag. I don't know why they have to color it this mountian dew/sci-fi green yellow color but they do. I asked our nurse Jo Ann about it an she said they are all dyed different colors. I also asked her if any were colored blue or purple and she looked me and seriously said, "there's blue... but don't get the blue one, you don't want her to be getting the blue one." Kinda scary don't you think? I mean Neo took the blue one in the Matrix and he turned out fine... Hmmm... Well, pray that I don't have to blog about the "blue one" any time during this process. This last week has been so much better than the first week of the High Dose Methotrexate (HDM). Abby hasn't had to wear a backpack full or Methotrexate nor any fluid... 2-liters, that is about how much it is when it is full so 3pm - bedtime probably feels like she is walking on Mars or wearing a heavy rocket pack on her back. The hardwood floors make it a bit better as she can slide it around behind her buy pulling the arm strap of the back pack. I can't say that I'm excited for this every other week HDM treatment but maybe this is exactly the treatment that will keep the cancer from returning by getting those last subborn cells. We also are dreading the Delayed Intesifycation (DI) phase after this but at least it is in the summer. I'm think we are going to get a nice big hammock to hang somewhere in the shade so that when she isn't feeling up to walking around we can just go relax in the back yard. She also seems to like to garden, or at least dig in the dirt, so maybe that will take her mind off of the DI side-effects this summer too. Who knows, one day at a time is how we take it around here, and since she is doing so good these days we're going to party while we can! Going to play with my girls... more to come soon.